Preschool Playbook: Doing Nothing at School Today? We got to be mini-chefs today and whip us a favorite treat--muffin pizzas. This week we have been focusing on foods that are good for us, that help us grow big and strong. It's always fun to have real food when we discuss this. I had English muffins, pizza sauce, and cheese for the children to put together a muffin. Then I baked them in the toaster oven and they enjoyed them for snack. I also had pictures of different foods out on the rainbow table. If the children wanted to they could make a collage. I had paper plates and glue, then then decided what they would like to glue on the plate to take home. 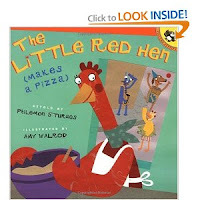 We finished up reading, "The Little Red Hen Makes Pizza," by Philemon Sturges. A new favorite book of mine. It also goes very well with our theme. I really like that form you use. I am going to copy the concept for my classroom. This is much simpler than the one I use (copied from The Mailbox years ago). 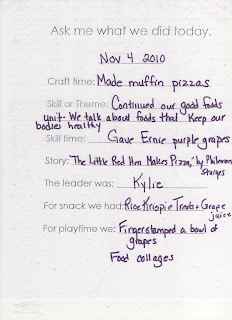 I like how it is tailored toward things the parent could ask the preschoolers.